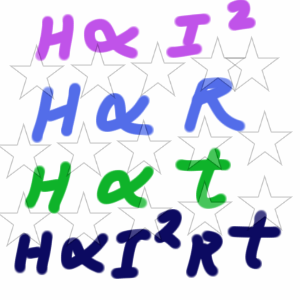 H = K. I²Rt where K is a constant. for I=1 Amp., R= 1 ohm and t= 1 sec. K becomes equal to heat generated at this condition. It is found heat generated is 0.24 calorie. This is also known as Jouls Law of Heating. The above video contains explanation of heating effect of current through a conductor. The equation derivation is also shown. Why 0.24 added while breaking proportionality is clearly explained.